It was pretty fun writing this. Learned a bit about the iPhone too. I took a litte creative liberties with the idea Dan gave me last night. First off, I tried to count microseconds from 0 to 10 seconds. That includes 0001 to 9999. Or displayed as 0.001-9.999. However, the iPhone can’t count that fast. The best it can do, or so, is centiseconds. 0.00-10.00 seconds. 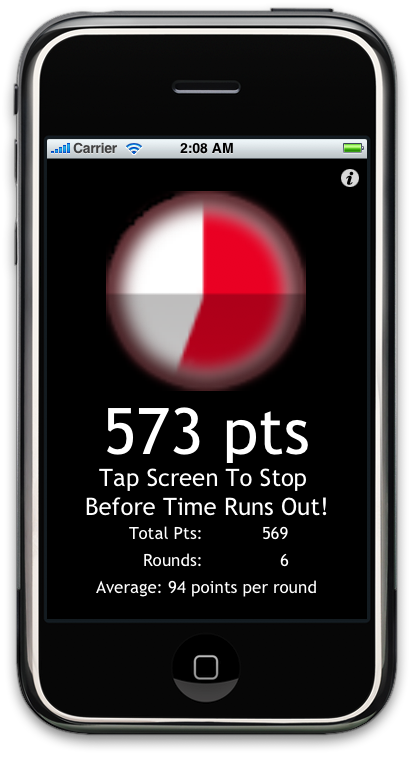 Therefore, I assigned one point per centiseconds – if you stop the timer at 5.73 seconds, you get 573 points. 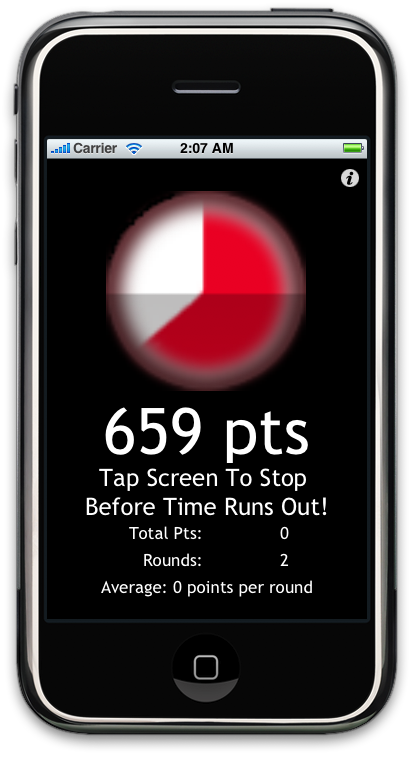 Of course, if the timer goes off, which it does with a nasty “buzzzz”, then you get no points. 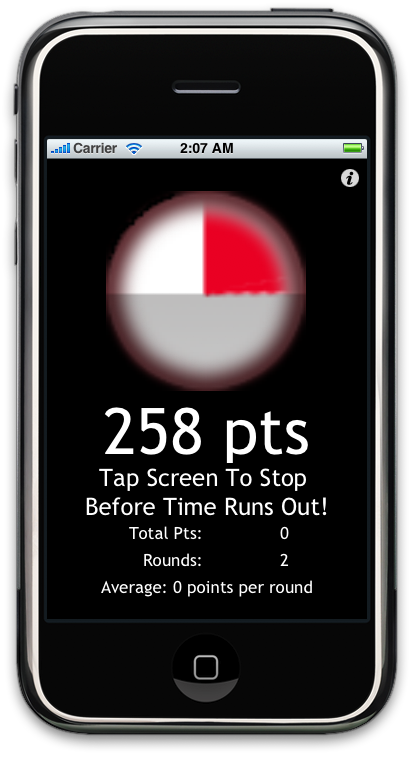 Dan mentioned that in his game you do multiple rounds each time adding the points in order to get higher and higher scores. Sounds good, but given lots of time, your score could grow endlessly. Especially if you play it safe and hit the stop key early, lessening the chances of getting timed out. Not like a game where your high score grows as your skill grows or you get lucky. That made me add an “average” label. The thinking being that by gaining some skills (strategy) or getting lucky, you could drive up your average as your top score. You would be limited to a high average of 1000, which would be virtually impossible unless if you’re especially lucky (or the random number generator fails). The strategy, which I’m sure any middle school kid can tell you, is to just press stop when the timer hits 500. If you play the game 100 times, the random stop time would be 100 or higher, 90% of the time, and between 900 and 1000 only 10% of the time. 50% of the time, the timer will stop at a number 500 or higher. If you get greedy and keep trying to hit the stop at 900 or higher, you’ll only manage to do that once every ten times or ten times every one hundred. You’d average 90 or so points. If you play it safe and hit the stop at 100, you’d also average 90 points. If you shoot for 500, you’d have an average of 250 points. Going to try this prototype with the kids and see if they get it and whether they like it. I can see why Dan called it Nerve. It is nerve racking to sit there, go for the stop button, only to have the buzzer time you out. Plus, I keep thinking that once the timer goes off, if I react quickly enough, I’ll somehow manage to beat it. This entry was posted on March 23, 2009 at 2:39 am and is filed under Nerve. You can follow any responses to this entry through the RSS 2.0 feed. You can leave a response, or trackback from your own site.